There is nothing difficult in the question, yet to find an answer you have to check three density values in tables - the last one needs interpolation as tables usually contain values for integer concentrations. So task is easy - but time consuming. Let's try solution mixer. Start solution mixer by using the tool bar or View menu. 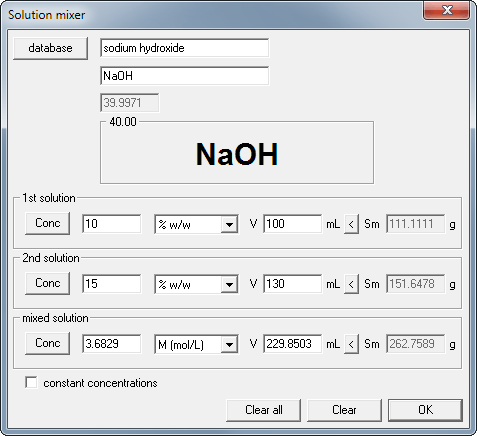 Select sodium hydroxide from the substances database. Select percent concentration (% w/w) from the drop-down list in the 1st solution frame. Enter 10 into concentration edit field and 100 into volume field. Repeat similar operations for the 2nd solution frame. Ready! Read the result in the mixed solution frame. If you want to know what the percent w/w concentration of the obtained solution is, just select the % w/w from the drop-down list and the concentration will be automatically converted. Select other examples to check how to convert between concentrations and how to prepare solution using CASC recipe.